No one seriously gave Leicestershire a chance. Yesterday, they played Kent in the T20 Quarter Final match at Grace Road. Before the match started, all the Sky commentators tipped Kent. Journalists, critics and various self-appointed experts rubbed their chins contemplatively and pronounced from on high that the Foxes were lucky to get this far. Even a report in the Sunday Times today started with “Leicestershire are as near to hopeless as makes no difference in championship and 40-over cricket this summer, so possibly they surprised even themselves by qualifying for the Friends Life Twenty20 quarter-finals”. It is almost de rigeur to look down one’s nose at Leicestershire, an unfashionable county by any measure. Lack of money; small ground stuck in the middle of a housing estate; over-reliance until a few years ago on Kolpak players; currently battling for wooden spoon honours in the County Championship; CB40 competition long given up for lost. There are those who even say they shouldn’t have first class status, such is their withering contempt. And even though the county has been in the habit of producing players for England and its associated development squads lately, the suggestion that James Taylor won’t seriously be considered for full international honours until he moves to a Division One county haven’t helped Leicestershire’s image as some kind of Dickensian cricketing ghetto that promising youngsters should be plucked from forthwith if they are to get on in the world. At the mid-way point yesterday, after Kent had batted first and amassed a colossal 203 for the loss of only 3 wickets off their 20 overs, there must have been a lot of prematurely written match-reports waiting only for pithily-scripted variations on “result never in doubt” before their authors hit the “send” button. But anyone who wrote Leicestershire off in this match, even in the face of chasing down the second highest T20 total ever scored at Grace Road, obviously hasn’t been paying much attention. 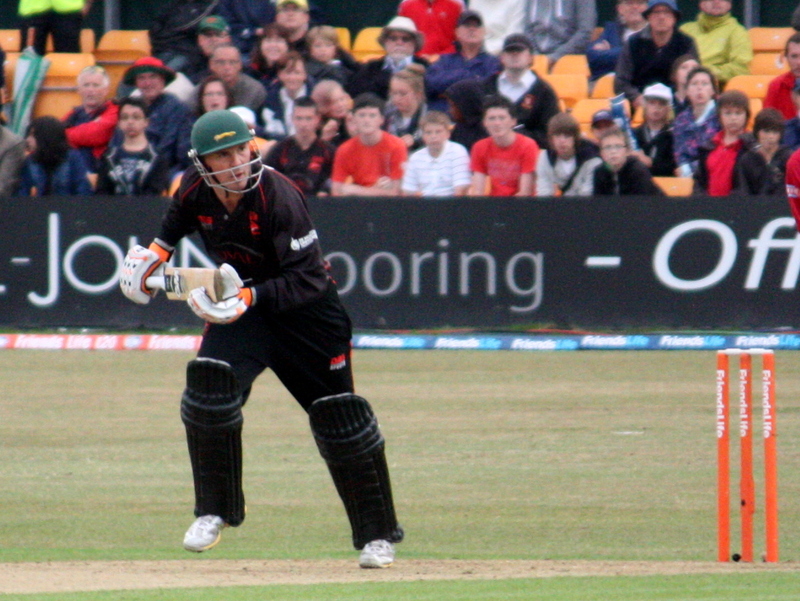 Partnerships were, and always have been, the key in this form of the game for the Foxes, and Leicestershire made their intent to not leave anything in the locker plain from the outset. Josh Cobb, reinvented as a pinch-hitter at the top of the order after a lull in his career following a maiden first class century at Lord’s while still a teenager, pasted Azhar Mahmood for 6 off only the 4th ball of the innings. He fell for 18, but opening partner Andrew McDonald carried on for a brisk 53 off 32 balls with every other Leicester batsman – bar Will Jefferson, who fell to a marginal lbw decision – carving the admittedly lacklustre Kent bowling to all parts of the ground. James Taylor, no doubt galvanised by being unfathomably passed over for Ravi Bopara for the England squad for the 3rd Test at Edgbaston, swept, drove and pulled for his 22 after taking a blinder of a flying catch in the field to put an end to Azhar Mahmood’s mighty innings of 91, but arguably the real star of the day was the man who was playing his last game at Grace Road. Paul Nixon, in the manner of Indiana Jones, could just as well say it’s not so much the age as the mileage that’s forcing him to hang up his bat, but neither seemed much of an impediment to him yesterday. 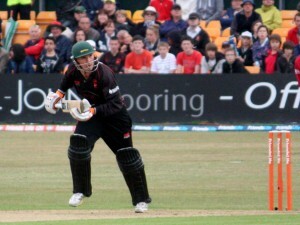 Hitting 4 fours and a towering straight six before he was dismissed, his 31 left Leicestershire needing only 2 runs for victory. Matthew Boyce hit the winning runs with a scorching offside boundary with 4 balls to spare. The playing area was invaded, Nixon was hoisted aloft, a pint pushed into his hand and he was carried off the field by an adoring crowd. It was hard not to conclude from this that there’d been perhaps a touch of complacency about Kent – borne out by their subpar bowling and fielding – and too on the part of everyone else who wrote Leicestershire off. It is because they are regarded as the underdog, and that in a year which has brought so much disappointment in the championship and CB40 competitions, that the Foxes will not die wondering in this year’s T20. The opponent who is most to be feared is the one who has nothing left to lose. They won yesterday because they were prepared to throw everything they had at chasing down the total even if it meant losing wickets. They have a potent mix of young, hungry talent and older, seasoned campaigners who know a thing or two about defying the odds. Paul Nixon, part of the one-day international setup that won the 2007 Commonwealth Bank series and salvaged some English pride after the horrors of the Ashes, knows this probably better than anyone. Neither Nixon or Andrew McDonald will be with the county next year. But before that, there is a semi-final at Edgbaston to be won. And beyond that, well, anything is possible. Yesterday, as the Leicestershire openers walked out to embark on that already written-off run-chase, I tweeted “Massive total by Kent, but I still believe”. And as the Foxes look forward to Finals Day on August 27th, I still do. Get your claws in, lads.